Sometimes we try to hide our emotions, but our bodies make them obvious. Body language is very important for showing what someone may be feeling. These pictures show different emotions through body language. Your Turn Match emotions to body language. 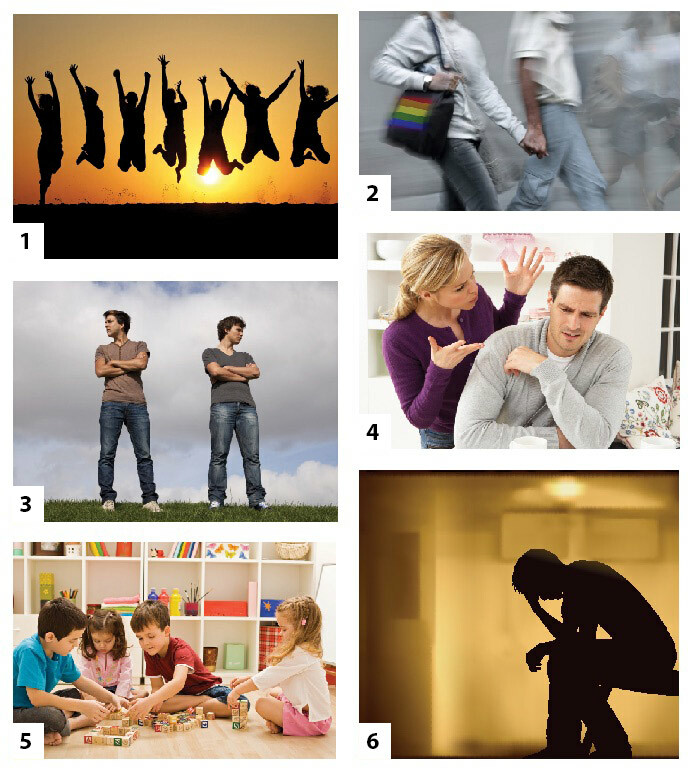 For each picture above, write down the number and describe the emotion or emotions that the people are showing. Then write some of the body-language clues that show the emotions. Compare your answers with a classmate's and discuss what you are seeing in the people's body language. Your Turn Show emotions with body language. Find a partner. Choose one of you to start as the person showing an emotion through body language. Have the other person guess at the emotion. Discuss the clues that revealed the emotion. Switch roles and repeat. Your Turn Pay attention to body language. Throughout the rest of your day, notice the body language of those around you. Silently in your own head identify the emotion that the person may be feeling. Try to remain mindful of others' emotions throughout your day. Seeing Emotions in Body Language by Thoughtful Learning is licensed under a Creative Commons Attribution-NonCommercial-ShareAlike 4.0 International License. Based on a work at k12.thoughtfullearning.com/minilesson/seeing-emotions-body-language.